For a while now I've been getting a bit pissed off watching riders chucking their gel packets and bits of food wrapping on the road as they go. Well, it seems this might be about to catch up with them. A Belgian environmental group is pressing for charges to be brought against three named riders in the Fleche Wallonne, citing Walloonian waste management laws. They say they witnessed the three riders, Benjamin Gourgue (Landbouwkrediet), Christopher Froome (Sky) and Blel Kadri (Ag2R) throw away bottles and packages as they rode. In the case of the bottles I think it's a bit of a non-issue. There are very few parts of a course where there is no fan to pick up the bottles, and indeed musettes, as souvenirs. That's a tradition. I've done it myself at races. On top of that at least one bottle manufacturer, Tacx, is supplying several teams with it's new Bio-Bottle, made from supposedly bio degradable plastic. But waste packaging is another matter. No fan is that obsessive! There is a real element of the old Mammys rebuke "you wouldn't do that at home" about this story. A rider wouldn't throw litter as they walk down the street so why do it on the move. What possible performance advantage is to be gained by chucking waste on the ground. Even worse most races travel through areas of scenic beauty making the offence worse in my book. Some race organisers claim they have clean up teams following behind. Come on, really?? And nothing is missed, blows away in the wind, sinks in puddles, etc, etc? Check out these videos of Spartacus himself riding to victory in the Tour Of Flanders (about 4:55 into the video) and Paris Roubaix (about 6:10 in). In both going cases, when you'd think he'd have better things to think about, he goes through an apparent ritual of clearing his pockets of rubbish as he powers to win on his own. Why exactly? 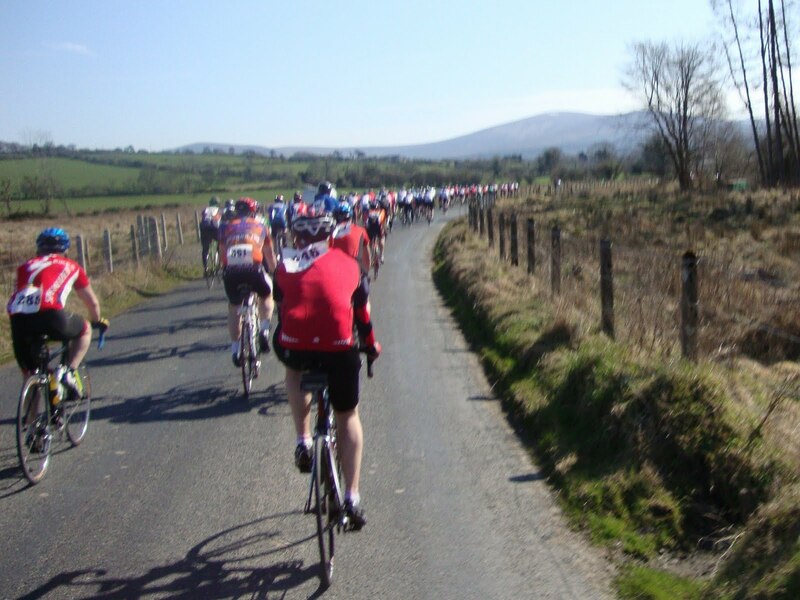 Yesterday was the second running of the Kare Tour de Foothills Sportive. 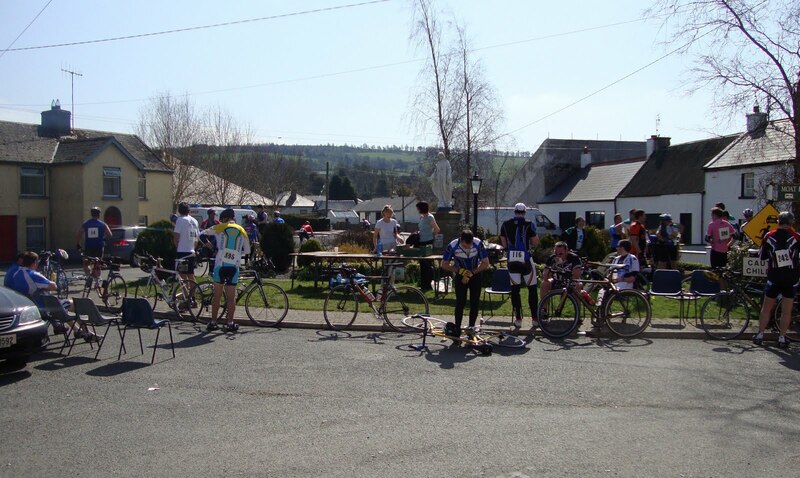 In total approx 450 riders of all ages and abilities took part over a choice of three routes covering 100km, 50km and 20km to raise money for Kare, an organisation that provides services for children and adults with intellectual disabilities in the Kildare/Wicklow/Offaly region. By far the biggest group was in the 100km ride which had approx 300 riders on the start line at Naas GAA Club. Last years event was my first organised sportive since climbing back on a bike seriously in 2008. I'd been commuting by bike over the years but I hadn't ridden more than 10 miles or so for a decade or more. As a result I lined up for the 2009 event with a degree of anxiety about the distance and hills ahead. To my surprise I got through quite well, getting over the hills better than I'd imagined I would. So this year I was feeling a lot less anxious on the line. I'd done more miles and hills in training, lost a few pounds (although nowhere near as much as I'd like to have) and knew the route. On top of that the sun was shining, like last year, there was little or no wind, and I'd hooked up with my old friend and training partner Stephen O'Shea on the line. It must have been nearly 20 years since we last rode our bikes together. 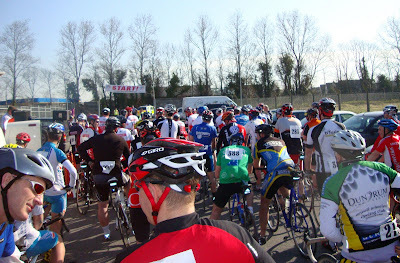 Some of the 300 odd riders lining up for the 100km ride. After the formalities we were off in a big bunch, escorted through Naas by Gardai a team of motorbike marshals. Even after so many years since my last race, I have to admit it was still a buzz to be riding in a big bunch through red traffic lights with people standing at the side of the road looking on. The bunch set a steady pace of 20mph-ish as the road climbed gradually towards Blessington. I stayed chatting with Stephen until just after Eadestown where a short, sharp rise had me falling back a bit. 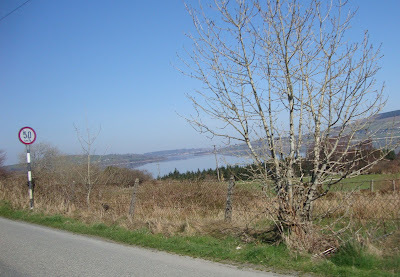 But I was still in the pack as we rolled through the stopped traffic at Blessington and dropped down towards the lake. Heading out of Naas in the bunch . On towards Manor Kilbride the bunch was starting to stretch out, with regular shouts of "Hole" to warn riders behind of the many potholes on the roads caused by ice and snow over the winter. The pace was still averaging over 20 mph but with the first hills coming up it wouldn't be staying together for much longer. Marshals motorbikes whizzed by regularly adding to the big event feel. The long bunch winds it's way towards Manor Kilbride. 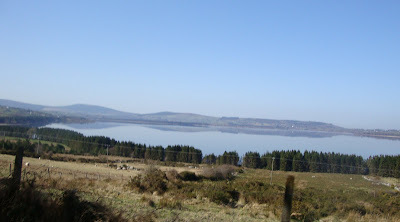 A sharp right before Manor Kilbride and the road started to roll up and down towards Lacken. The big bunch quickly split up and within a few miles there were small groups and individuals littered along the road, mixed in with the 50k riders who had started after us but had taken a shorter route to that point. 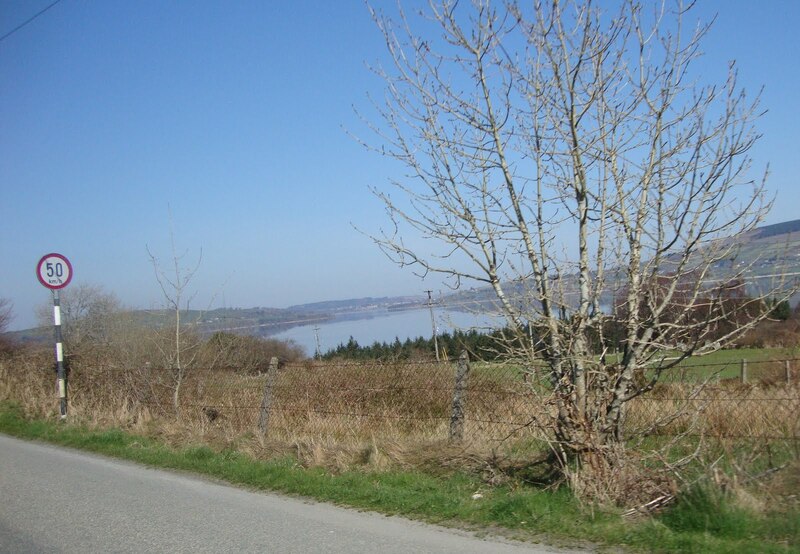 Descending beside the lakes towards Lacken. From this point on it was one short, steep hill after another, alongside the flat calm lakes. Hard going but absolutely gorgeous! 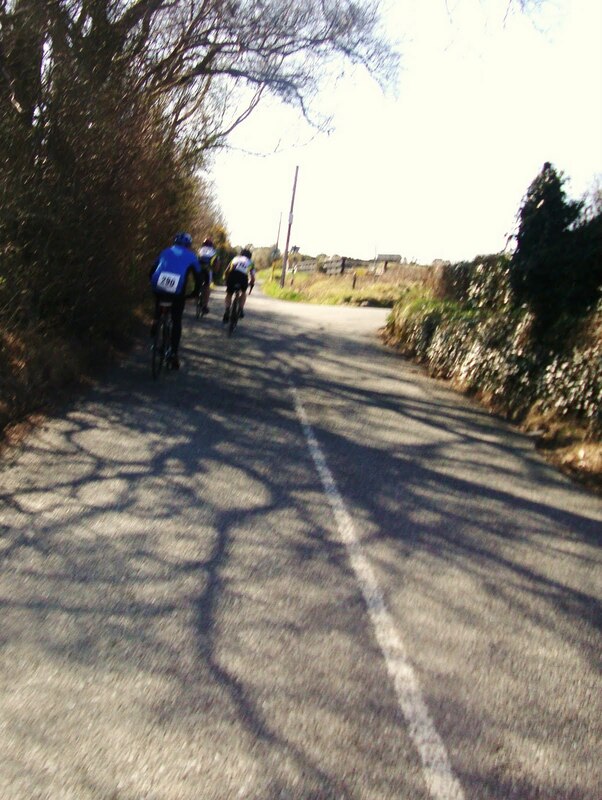 And, of course, the short, sharp hills were followed by some exhilarating, short , sharp descents. One of the many short rises after Lacken. The lakes were like a mill pond reflecting the April sunshine. Some of the descents put that speed limit at risk. While I was riding at my own pace along the lake some riders were coming up from behind while I was catching and passing others. I don't think there was any point where there were no other cyclists in view, a sure sign that there were a lot more riders than last year (or maybe I wasn't as far behind as last year!). 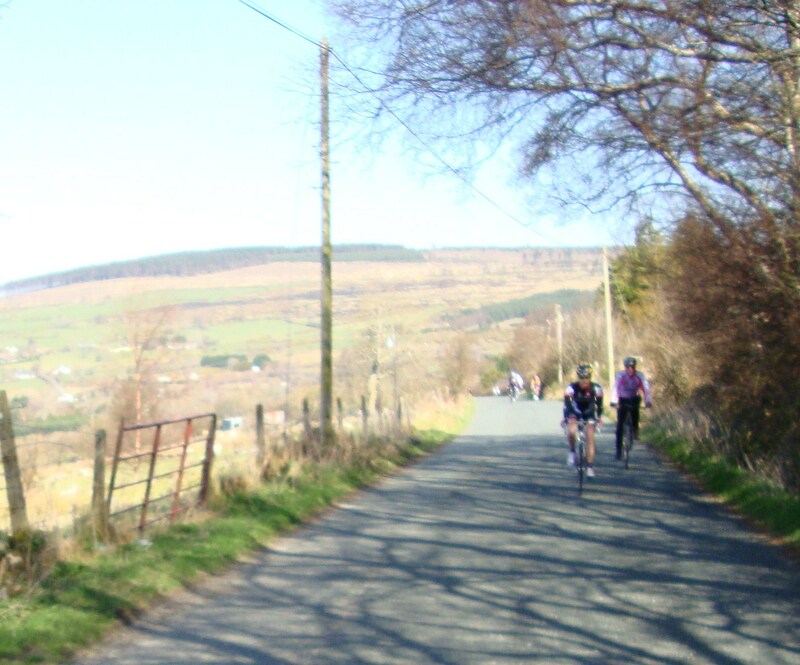 After the steep climb through Ballyknockan, we turned left up the equally steep climb out of Valleymount and headed towards the Wicklow Gap road. Riding along this road the views south into the mountains were amazing. It was at this stage that I started to feel the beginning of a cramp in my right calf and also some soreness in my back, but with only a 10 miles or so to the rest stop I ignored that and kept slogging along. After getting around the downhill hairpin junction, aided again by the brilliant motorbike marshals stopping traffic, I took the fast descent down to Kings River Bridge and started what I mistakenly remembered as the last major climb of the route. This one wasn't so steep and was followed by the very fast descent into Hollywood village. From there we took a very rutted, and far more rolling than I remembered, road into Donard and the lunch stop. And that was the only disappointment of the day. Last year we all got a goody bag with sandwiches, fruit and sweets which was a big boost for the last 30 miles. Unfortunately this year the organisers appear to have underestimated demand so by the time I got there (and I was far from last on the road) there was only a few oranges and apples left. Welcome, if hungry, break in sleepy Donard. I hooked up with Stephen again in Donard where he was hanging out with his Orwell clubmates. 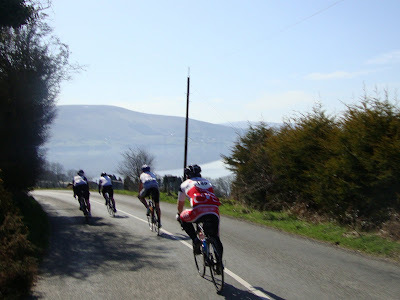 Even though we knew they'd be leaving there as a group we were both feeling a bit tired so decided to ride ahead on the road and try to get over the climb before Dunlavin before them. The plan was that they would catch us after that and we could tag along for the relatively flat final 20 miles home. It didn't quite work out that way! We got over the deceptively hard climb before Dunlavin OK followed by the bumpy descent through the town over several speed ramps and lot's of potholes, but about three miles on both of my calfs suddenly cramped up. I had to stop and get off the bike to try to stretch them out but with limited success. Back on the bike and I was struggling. Thankfully Stephen was also feeling a bit tired so he was happy to lower the pace a bit and stay with me. On through Brannockstown and the right turn for Ballymore Eustace. Half a mile on my back wheel started to make a squeaking noise. Just what I needed! After a bit we figured it was the plastic/rubber cover of the hub which wasn't turning as it should and so was rubbing against the rotating hub. Maybe I bent the axle on the bumps in Dunlavin? In any case this is when the plan fell apart. As we were stopped for the squeak the Orwell group passed us, ruling out any chance of a tow to Naas, although realistically I don't reckon I'd have hung on for long anyway. On through Ballymore Eustace and slowly up the climb out of the village. 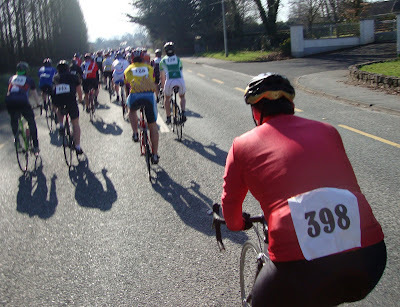 About 15km to go and I was relieved to know we were on what I remembered as the flattish road to Naas. But it's funny when you're knackered how a flat road suddenly becomes very hilly indeed! Worse still the cramps came back with a vengeance about halfway there. This time as I was stretching at the side of the road the Order of Malta ambulance happened to come along so at least I had some help with that. 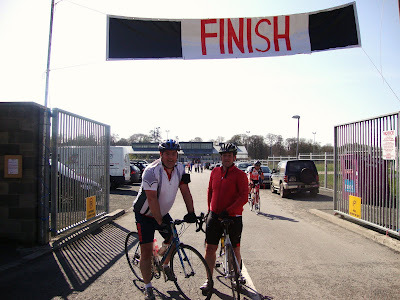 I got back on and finally, after an interminable final loop around the inner bypass, and it's countless roundabouts, we made it back to the Naas GAA club and the finish for a welcome shower and a free plate of hot food. Yet again the TDF was a very well organised and very enjoyable event, even if I did suffer a lot more this year! As I've said the only gripe was the lack of food at Donard but that isn't to take away from the great work put in by the organisers, the volunteers, the marshals, the Gardai and the Ambulance crew. Quite how they keep arranging such amazing weather is a mystery though!